It’s been a funny month this month, the month of May. It’s flown by for one thing. I didn’t even realize we were at the end of the month until today. Ooops. 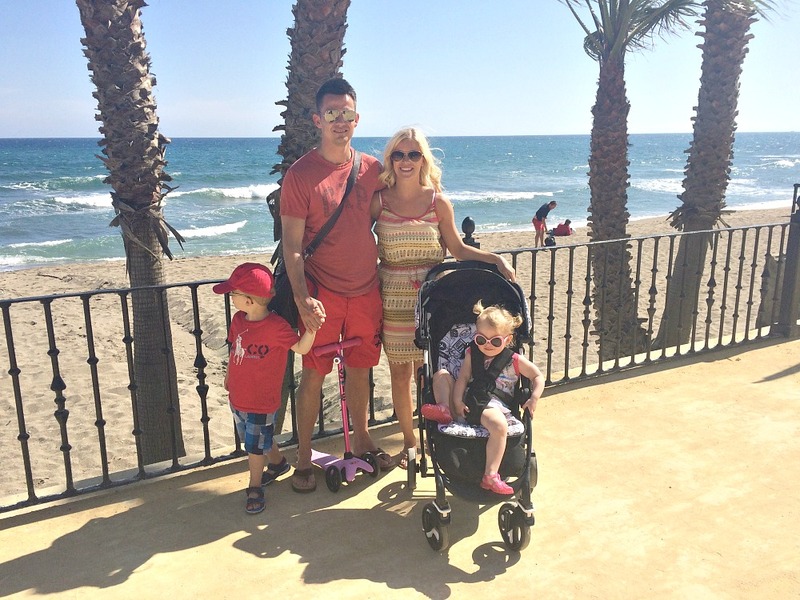 We have been so grateful too this month having been to Marbella to see our friends new house who just moved there. The weather was lovely for the most part of our visit but our travel curse of illnesses have plagued us again this month. I don’t know if it’s just coincidence or if it’s all the traveling that my kids keep getting so ill but either way it’s putting a slight damper in our big year of travel before B starts school. Last month while we were in France, B had a throat infection that saw him not eat for five days and get really skinny. Just when he was making up for it all, we were packing our bags for Spain where MM started vomiting and diarrhoea when we got there. If it wasn’t bad enough that our kids keep getting sick and like true trooper still have a nice vacation in spite of it all, my friend’s kids this time ended up with it. So we had four children sick on our hands in one house to cope with. I never felt so guilty and awful about getting another family sick. It was horrible. I think we need to start wearing face masks on the plane so my kids poor immune systems can have a break and us too! In true fashion my kids are not getting into the family captures this month nor last. Lately, I even have to really bribe the husband to get involved. I don’t want to nag and beg for them each month but it’s the memories and the places I want to capture for our future. I would love to have a full photo album someday of us all each month, happy and in our element but that’s just not reality is it? As you can see B wants to run and play on the beach as soon as he saw it and MM is literally trying to undo her seatbelt and jump out of the stroller to join him. Neither of them care one bit about the photo Mommy is asking someone to take for her. Typical but that’s our mad crew and our reality so I love the photo just the same. I can tell just by Mr P face he is about as happy as the kids are on my photo capture. It was such a beautiful place and I would love to one day have a professional come take family photos of us on the beach. There is something so mesmerizing about the waves and the sandy behind. Marbella was so lovely and I will be blogging about it soon and share it all with you. His new Timberland baseball cap on backwards like a dude. Her new pink sunglasses from Spain. Traveling and seeing some amazing places recently. Booking his ten day golf trip. All the surprises Mommy has been spoiling him with lately. Traveling to see good friends. Absolutely cleaning every cupboard and closet out and taking it to charity (4 car loads full). Watching how much MM has changed in the last month. Playing with close friends in Spain, both adults and kids alike. Playing outdoors in the sunshine abroad. The sun on our backs. I say we are loving being together as a special thing this month because we are about to be apart for six whole weeks from Daddy so we are trying to make the most of this time we are all four together. My Me & Mine of July and August will be minus the leader of the family so it won’t be the same but we will nevertheless have him in our thoughts while we are in America. This month I am sending you to the beautiful Fritha at Tigerlilly Quinn and we are all very excited for Fritha’s baby announcement and so many new additions are coming this year to the Me & Mine crew including Alex and Lucy’s babies too. I can’t wait to see all the family captures. I think you do amazing lovely. My kids literally scream. Hence why it has been months since I joined in. Love the photo of you in the infinity pool. It looks amazing. I hope you have an illness free June. True they really keep giving it a go! We just wanted to have a bunch of traveling this year before B went off to school and tied to term times where we could make amazing memories and its just been full of sick and sofas abroad. Shame we couldn’t capture the happiest moments in between as they were just tired and sick to take photos this month. Hoping that’s all different when we get to america but then we are without daddy for six weeks boo!!! The kids loved the infinity pool! Thanks for hosting beautiful. I love the photos, they are true family life. Such lovely photos. Sounds like you’ve had a lovely month with lots of travelling and sunshine. These are gorgeous photos, even if B and MM weren’t complying as you say, it makes it more ‘you’…I hope that you don’t get any sickness before you head to America, I would say you definitely deserve a break from that!! Oh I love the infinity pool shot – what a gorgeous place to bathe! And I’m so sorry to hear that the bugs keep following you around – you’ve really had a year of it so far! Fingers crossed they will hold off on the plane to the US and you’ll have an amazing time! Lovely photos! That pool looks so amazing – very jealous! Oh no I am gutted for you that the illness bug hit you again for your holidays, that is so unfair. However I love you photos and you are right that it doesn’t matter about getting them to look the right way as its your little family. I love the natural ones, however I haven’t worked out how to picture those and keep them in focus yet! I really feel for you, every holiday we have taken our daughter on she has been ill so I can sympathise! On the plus side the pool & the beach looked amazing, I hope you have some good memories as well with your family & friends the holiday. Its just not fair is it. We save all this time and money up to have a few great holidays before B starts school and its plagued by vomit and throat infections and fevers. Just not fair at all. it’s hard enough waiting for good weather. We still had great memories thank you. I can’t get anyone to voluntarily join in our photos either, it is all about the bribery! haha. What a lovely month of travel you had! I tried the bribery and it used to work but lately it’s gone completely out the window. Hoping next month is way better. Thanks we have enjoyed it minus illnesses as always for us. Thanks Alex. I always have to include what we are all loving together afterall its a family post and one that’s centered around us all as a unit as much as individuals. Glad you liked it. Hard to get my brood to actual sit still for a second to take a photo these days. lol Guess, I am just lucky I have two to share. lol Sad Mr P will be missing in a few next few months. Thank you. They didn’t smile as we made them stopping playing while we took it. hahah Kids! But it was so much fun. Yes, hopefully that’s enough illnesses for awhile. Thank you Nicola. I know it’s just typical and my luck lately. I can’t catch a break on what should be the biggest traveling year of our lives. Boo. My kids never stay still for a shot ever. lol Bless them. Oh yes bribery is really worth it in the end for sure. Sadly it doesn’t work at too young of an age but we are almost there. hahaha Thanks babes we are having a wonderful time indeed.